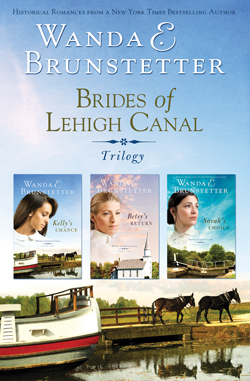 A historic Pennsylvania canal town sets the stage for three unforgettable romances. Life for Kelly McGregor is a daily drudge of driving her father’s mules along the Lehigh Canal. . .until a shopkeeper makes her far-fetched dreams seem possible. Betsy Nelson is reluctant to see her minister father retire—and even more reluctant to meet the man who is to take his place. Widow Sarah Turner longs for a life that doesn’t revolve around canals; then a canal boat captain and a blacksmith both vie for her affection in a battle of heart over mind.